You may be familiar with Chateaubriand, a dish made of the tenderloin cut of beef that originated in France. It is said to be named after Francois René Vicomte de Chateaubriand, a diplomat serving as an ambassador to Napoleon Bonaparte, and created by his chef, Montmireil. The details of the exact recipe, however—like whether it was a tenderloin or a sirloin, or was it served with a Bernaise or other sauce—as well as the cooking technique (charred on the outside or not?) differ depending on from where you get the information. What is consistent throughout, though, is that a Chateaubriand was always served with chateau potatoes. Crispy around the edges and buttery rich, chateau potatoes are fantastic not only with Chateaubriand but with any roasted meat or poultry dish. Traditionally cut into olive-shaped pieces, chateau potatoes taste just as delicious sliced and sautéed in butter and seasoned with parsley. Melt the butter in a large oven-proof skillet over medium-high heat. Sauté the potatoes in the butter for 5 minutes. 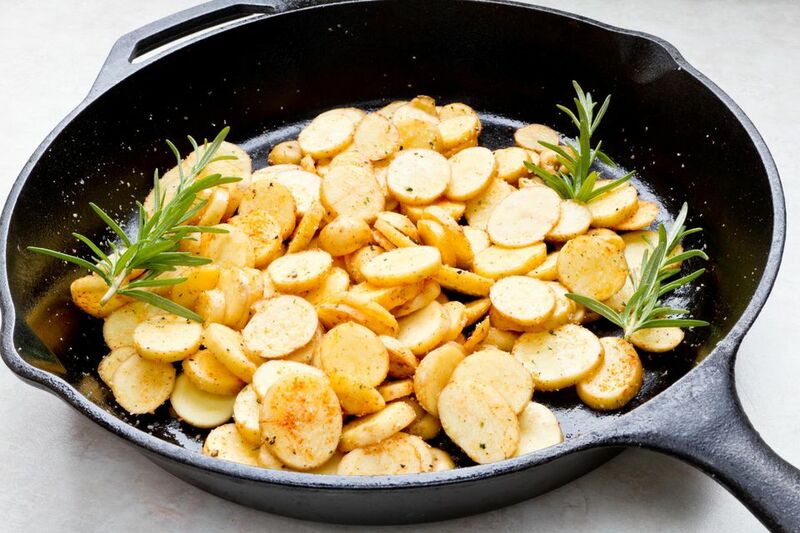 Remove the skillet from the oven and sprinkle the browned potatoes with the chopped parsley, salt, and pepper. Serve the chateau potatoes immediately. To save yourself some time, you can use smaller new potatoes or even fingerlings, and keep them whole instead of cutting into oval shapes. To recreate the same texture and flavor, you should still peel the potatoes before cooking. And whether you are using larger cut potatoes or smaller whole potatoes, you should pat them with a towel after peeling to absorb any moisture. The potatoes will crisp up better if their surface is nice and dry.